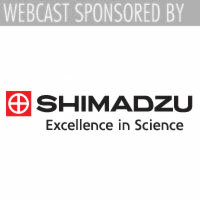 The Scientist Magazine announces a discussion on new approaches for protein biomarker discovery and applications, sponsored by Shimadzu, as the first of The Scientist’s free, live webinar series. "This is the event where you hear from protein biomarker experts on what has worked for them and ask them about what can work for you. Getting to share your challenges and receiving their feedback in real-time is priceless." This free webinar, “Tackling the Challenges Involved with Protein Biomarkers,” brings together two experts who will discuss new approaches for dealing with everything from enriching the target protein molecule to methods now in use for isolating and detecting molecules, for biomarker discovery and applications. Before a biomarker can be put to use, it must undergo several stages of confirmation, validation, and qualification depending on its intended use. Sample preparation involves many challenges. Once an appropriate method has been chosen to isolate and measure the biomarker or pattern of markers, technical parameters of the assay must be defined to establish its sensitivity, specificity, reproducibility, and reliability. To take advantage of this free webinar and experts' advice, click here: Register Now! This session is slated for 90 minutes and will be divided into a 60-minute presentation with a 30-minute open forum for a live Q&A, all using the GoToWebinar platform. After the session, all attendees will receive links to the presentation materials posted on the-scientist.com. Dr. Katherine Williams is an assistant professor in the Department of Obstetrics, Gynecology, and Reproductive Sciences at the University of California, San Francisco, and is a senior member of the Sandler-Moore Mass Spectrometry Core Facility. Her research program is focused on using proteomics for biomarker discovery and verification in a wide range of human disease biology. Dr. Lance Liotta is a tenured professor at George Mason University in the Department of Systems Biology, College of Science. He was one of the first scientists to investigate the process of tumor invasion and metastasis at the molecular level. Liotta has invented and patented technologies in the fields of diagnostics, nanotechnology (hydrogel nanoparticles for biomarker harvesting), microdissection (laser-capture microdissection), and proteomics (reverse-phase protein microarrays), all of which have been used to make broad discoveries in cancer biology and cancer therapy. The Scientist has informed and entertained life science professionals around the world for more than 25 years. The title provides innovative print and online coverage of the latest innovations in life science research and industry developments including trends in research, new technology, news, business and careers. We reach leading researchers in academia and industry who are interested in maintaining a broad view of the life sciences by reading insightful articles that are current, concise, accurate, and entertaining. For more information about The Scientist, visit http://www.the-scientist.com.